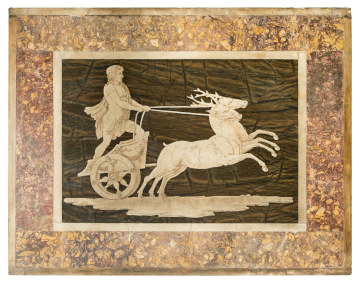 Intarsia (marble mosaic) panel of a youth driving a biga (chariot) drawn by a pair of stags. You are here: CollectionsOnline / Intarsia (marble mosaic) panel of a youth driving a biga (chariot) drawn by a pair of stags. A youth, clad only in a cloak which hangs from his left shoulder and flutters out behind, drives a pair of stags to the right, in a Roman-type chariot with a decorated wheel and garlands on the body. The composition and execution are clearly work of the eighteenth century. Cornelius Vermeule included this intarsia panel in his catalogue of Soane's antiquities because of its traditional association with Hadrian's Villa, no doubt a 'provenance' provided prior to its entry into Bishop North's collection and preserved by Soane in his descriptions of the piece. This work is an excellent example of the most dubious class of objects which early romantic archaeology, coupled with deliberate misinformation on the part of dealers, linked with the famous Villa which was in effect the great hunting ground of the neoclassical period for ancient marbles outside Rome itself. Soane displayed this piece in his ground floor Lobby to the Breakfast Room, created in c.1825 where it is shown in a watercolour view of 1826. Purchased from the collection of Bishop North in 1825 for £9.5.0. and at that time said to have been found in Hadrian's Villa near Rome. Description of Sir John Soane's Museum: 1930, pp. 84-85.